Bryn Mawr, Pennsylvania — A Christian preacher who engaged in street preaching to patrons of a Pennsylvania bar district last month has been found guilty of disorderly conduct for his activities. Jim MacPherson told Christian News Network that he joined other local Christians on a Saturday night to share the Gospel on the streets of Bryn Mawr, Pennsylvania out of their desire to be a light in the darkness. It was his first time ever to street preach. “God placed a heavy burden on my heart to minister to the lost people who are out in the world, because that’s who I was three years ago,” he said. The men originally set up down the street from Kelly’s Taproom, a popular hangout for college students, especially on the weekend. One man stated that he could hear the song “Sweet Caroline,” which was being played inside the bar, all the way at the end of the street. He also noted that the establishment has a history of complaints over its rowdy night club atmosphere, which continues into the early hours of the morning. However, as MacPherson and others began preaching and distributing tracts to passersby, they were the ones approached by police. However, MacPherson outlined that the officer was unsure of the content of the local noise ordinance, and kept returning after checking on matters with his supervisor. During this time, the men had moved across the street from the bar and were reaching out to a number of people coming and going from the establishment. “The officer said that we were fine [to preach], but that if he received any complaints that he would come back and ask us to turn it down,” he stated. Approximately an hour and a half later, Officer Swain returned after receiving a complaint from local resident Paul McNabb, who was walking the streets that night to “patrol” the area. McNabb is known in the community for lodging complaints against activities that he opposes, including the loud music emanating from Kelly’s Taproom. MacPherson then ceased preaching and the men moved across the street simply to talk with people coming and going from the bar. However, approximately 30 minutes later, Swain’s supervisor arrived and cited MacPherson for disorderly conduct for making “unreasonable noise” by preaching across from the bar — even though MacPherson had stopped speaking altogether. Video footage of the discussion with police further captures one of MacPherson’s friends taking issue with the logic of the sergeant. On Tuesday, MacPherson appeared before Magisterial District Judge Kathleen Valentine, who found him guilty of disorderly conduct. 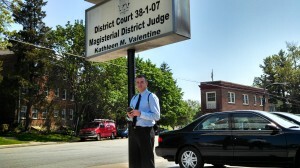 Valentine required that MacPherson prepay nearly $450 in order to obtain a hearing, which included $300 in fines and other related costs. MacPherson explained that Valentine outlined that she personally knows McNabb, which he felt robbed him of the right to a fair trial. He advised that he plans on appealing the decision in hopes of having the case heard by an impartial fact finder. In addition to seeking an appeal, MacPherson said he was going to continue to take the Gospel to the streets. MacPherson immediately took to the streets to preach following his conviction.